We considered featuring the brief friendship between Sylvia Plath and Anne Sexton, poets who are sadly as famous for their suicides as for the brilliance of their work. But when we dug deeper, we discovered a longer lasting and more nurturing friendship. 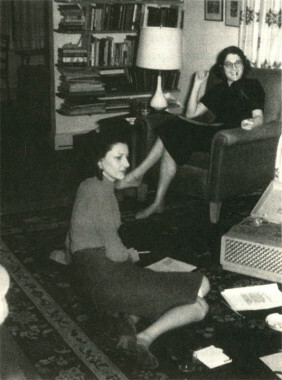 At around the same time that Sexton was meeting with Plath for martinis in the Ritz, she joined a local writing group where she got to know another female poet, Maxine Kumin. When Sexton first set eyes on Kumin, she considered her ‘the most frump of the frumps’. While Kumin admired Sexton, who was ‘a little flower child, the ex-fashion model…totally chic’, she also found her terrifying. Certainly, Sexton’s more flamboyant style was reflective of her fiery nature, while Kumin was far more restrained and stable. at a creative writing workshop. Every effort has been made to obtain permission to reproduce this photograph, credited to Doris Holmes Eyges. Perhaps because of these dissimilarities, Kumin and Sexton soon found in each other a deep creative support. They started to attend poetry readings together, hearing the likes of Marianne Moore and Robert Frost, and they reassured each other that their own work showed promise. Later, they even came up with titles for each other’s poetry collections. It would be easy to assume that Kumin was the more nurturing of the pair, especially since she postponed moving to the country because she felt Sexton needed her close by. But Kumin was always keen to emphasise the mutual nature of their support. Sexton dropped everything, for example, to read Kumin’s novel draft when, during a trip to Rome, she received an airmail packet from her friend. Moreover, Kumin claims that Sexton ‘pulled me out of my shell’ and ‘made me see that the cerebral really needed a strong admixture of the visceral’. As well as meeting up in person at least twice per week, they got into the habit of making regular calls, sometimes talking for hours on end, and even critiquing each other’s drafts over the phone. During a period when both women had won prestigious fellowships at Harvard, and so were feeling ‘flush and important’, they went so far as to install a secret second phone line. They would sometimes keep their call linked for hours on end, interrupting their poetry discussions to make dinner or hang out the laundry, and then they would whistle into the receiver when they were ready to resume. Their illicit phone line allowed them to work together without having to worry about their husbands’ disapproval. Indeed, the pair kept their mutually supportive friendship intensely private for many years. Kumin, whose formal, reticent poetry won her a Pulitzer in 1973, had been represented by critics as the rival of Sexton, whose wild, confessional style had won her the same prize six years earlier. Curiously, the pair felt so ‘ashamed’ of their friendship that they had allowed this myth of rivalry to continue for years before finally announcing that they were actually the closest of friends. Their relationship would have felt more legitimate and less clandestine, they felt, if the women’s movement had existed when they first met. They were the women’s movement, they joked, they just hadn’t realised it. After Sexton’s death, Kumin reminisced that ‘one of the joys of our relationship was the ease with which we traded dresses back and forth’, admitting that they practically fought over certain outfits, such as a red and white polyester dress that they both adored. This month, we will follow in their footsteps by choosing outfits from each other’s wardrobes and then we’ll post about our experiences of wearing them. I love the detail about the secret phone line – were calls free in those days? I think local calls must have been free! Before they installed the secret line, their husbands used to complain about the hours they spent on the phone to each other, but I got the impression that they were bothered about the time rather than cost. I just love the poems Maxine wrote about Sexton. Such a seemingly unlikely, but great, pair.